Officially classified as a re-siting because the new one is only 125 yards away and has the same name. The station had to be relocated because the curves at the ends of the platforms prohibited their lengthening to accommodate 3-car trains. The platforms had already been extended for the provision of 2-car trains. Aerial view, courtesy of Google Earth, showing (1) the old station still in situ and (2) the area that the new one has been built in. 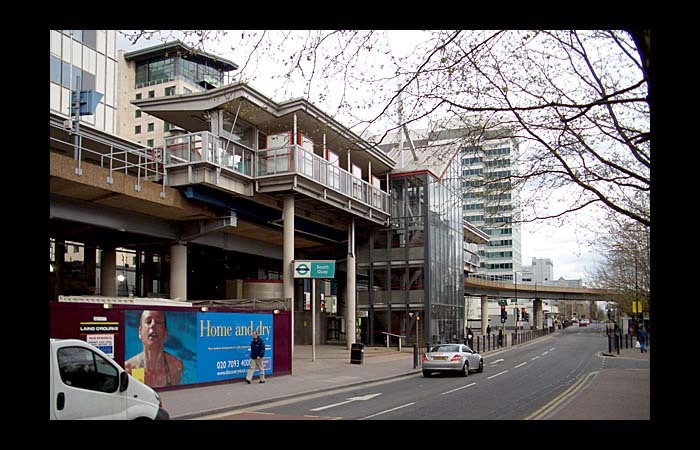 The old station viewed from street level in 2005 and - moving your cursor over the image - in 2009, two months after closure. Location of the old, looking toward the location of the new. The new station has been built straddling the straight section of track, despite the hump in it. The curve in the foreground is what prevented the original station from being extended on its eastern side. The ticket area, lifts and stairs to the platforms. The westbound platform looking in a westerly direction. The offset nature of the platforms is apparent here. Westbound platform again looking in a westerly direction. The curve of the tracks immediately after leaving the station is what prevented it having its platforms extended on the west side. Easterly view from the westbound platform. Easterly view from the eastbound platform. Again the offset platforms are noticeable here.